Independent National Electoral Commission (INEC) has released an interim report in the Rivers state Legislative re-run elections that took place today, 10 December 2016 in various constituencies earlier affected. “Following the release of the timetable fo the conclusion of the National and State Assembly re-run elections in Rivers State on the 3rd November 2016, the Independent National Electoral Commission (INEC) proceeded to conduct the elections in the state as scheduled to day, Saturday, 10th December 2016.” The report said. The electoral body described the exercise to be generally peaceful except in some few local governments were materials were reported to have been snatched. “The elections were generally peaceful and the turn-out was impressive except in Akuku-Toru, Gokana, Khana and Tai Local Government Areas. “There were alleged reports of dynamite explosions in Akuku-toru; INEC officals were attacked in Khana; electoral materials were snatched in Andoni; and our staff were prevented from conducting the elections in Tai state constituency. “In a few other areas where hoodlums threatened the conduct of the exercise, the security agencies intervented and ensured that the elections were conducted in a peaceful atmosphere. 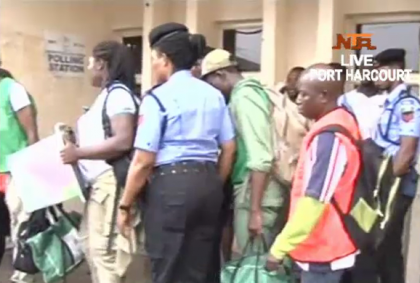 INEC urged the people to be cooperative as they await the results of the elections. “In the meantime, actual voting has ended in most polling units (Pus). “We urge the good people of Rivers state to continue to cooperate with the commission so that ultimately, we have results that are acceptable to the Stakeholders.” The report said.